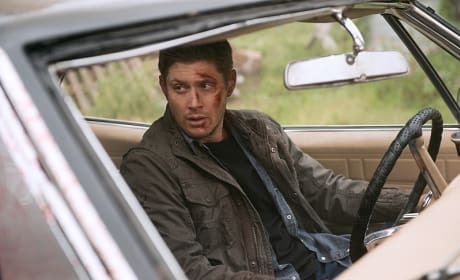 After what seems to have been an intense case that involved Sam, Dean and the Impala getting beaten up, the brothers are back on the road. The cases don’t stop, and neither will the brothers. Though, are both headlights not working this time? 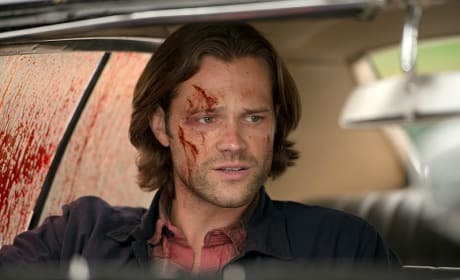 Sam also looks like he just went to war, and the Impala is bloodier than usual. Sam seems ready to have another chat with Dean, like about what they heck they just went through! And like his older brother, this Winchester knows how to look good even covered in blood. Dean looks like he’s just been through hell. 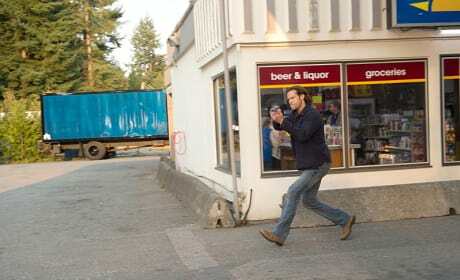 It’s a good thing he can catch his breath in the Impala, but whatever he just faced off against had to be deadly. And that’s a lot of blood. But the elder Winchester knows how to still look good, doesn’t he? 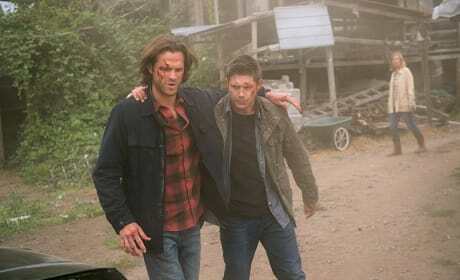 Sam and Dean look like they got involved in a bloody mess. But the two have managed to make it out alive together. 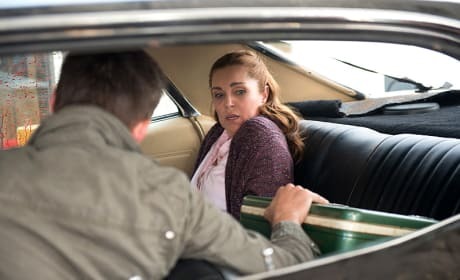 It’s good to see both of them helping each other out as they head back to the Impala. But isn’t that how it should be? Sam has got his gun drawn and looks to be running after someone or something. Did someone just rob the liquor store? Did someone steal the Impala? Either way, Sam means business and is ready to get the job done while looking like a badass. 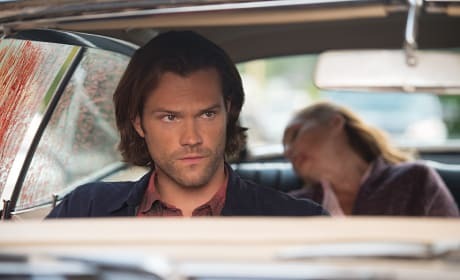 When you’re Sam Winchester and you’ve got those flowing locks of hair, it’s a shock he doesn’t check himself out in mirrors more. OK. Maybe he’s taking a look at the woman in the back seat who seems to have passed out or died from perhaps opening up the box. Like Pandora, the woman just couldn’t help but take a peek inside the box. So what the heck is in there? And what’s up with the blood splatter all over the car window? Something just went down. Something… supernatural. Everyone do your best Brad Pitt impression from the film Seven. That’s clearly what the woman looks like she’s trying to do as Dean puts his hand on what looks like a cooler. I’d assume the brothers keep their beers in there, but that woman looks far more freaked out for it be a nice cold one. Sam and Dean are clearly headed on their next mission, ready to hunt down whatever scary creature is causing problems in some sleepy town. 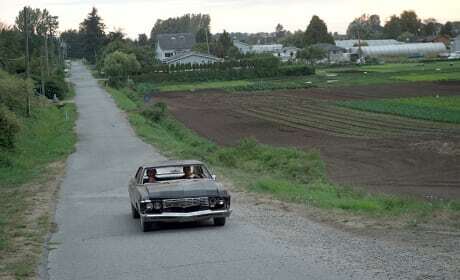 So, of course, Dean is going to be the driver and Sam will take shotgun. Now, what music will the Winchester brothers be listening to? 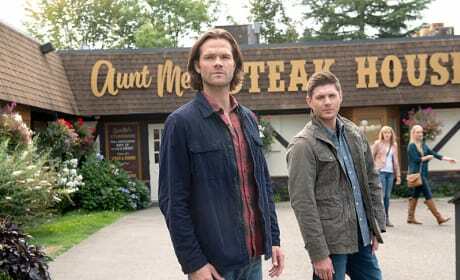 Sam and Dean must have had a delicious meal at the Steak House, because they look ready to get back on the hunt. But what is it they spot? And did anyone notice the ladies checking the brothers out from behind! Sam looks like he’s getting some big secret off his chest. Is he telling Dean about the infection he recently cured? 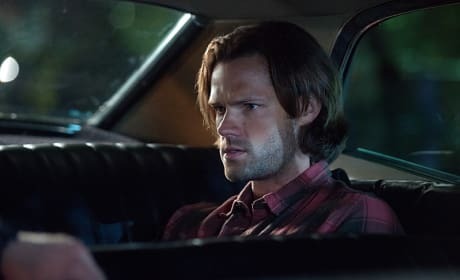 This is a serious brother moment that seems perfect for having in the Impala. 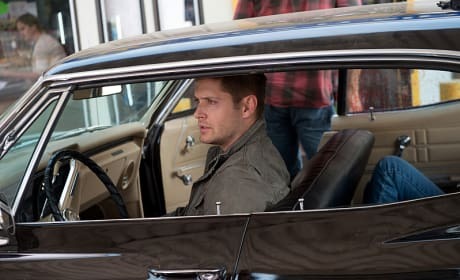 The Impala seems like the perfect place for Dean and Sam to have a real chat and get some bro time in. Granted, Dean looks mighty serious, and it is night, but if there’s one thing we’ve learned, these brothers will pull through together no matter what.